Sunsets are gorgeous images to capture. At the end of the day, it can be a reward to wrap up the thrill and adventure of outdoor photography. Taking photos of beautiful sunsets are often valued because of its elegance. At Half Dome, sunsets redefine the beauty of this towering landmark right at the heart of Yosemite National Park. This is a beautiful snapshot of the majestic Half Dome amidst a gorgeous sunset. This image has the depth and character which depicts a sense of wonder. 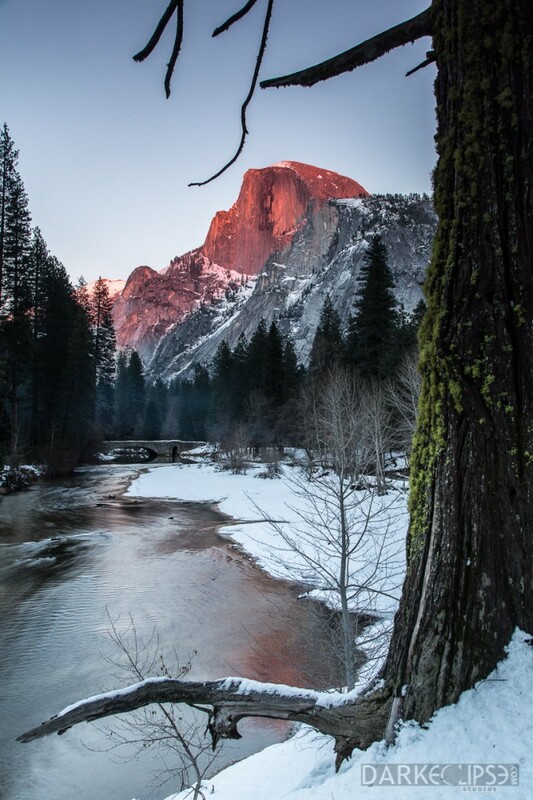 The wintry surrounding magnifies the towering elegance of the Half Dome. Witness the power of the sun without its blinding rays. The blanket of white snow adds more personality to the photo. A sense of balance can be seen in this photo involving the sun and the cold winter season. Half Dome appears illuminated during this amazing sunset at Yosemite. The elements which made this photo to be really exceptional blended effectively. With a dash of enthusiasm and creativity this outdoor photography masterpiece has depicted a dazzling façade of Yosemite’s Half Dome. The elements in the natural environment can be quite dynamic. Thus, capturing images of sunsets can be a challenge. The right blend of light metering, timing, distribution of the clouds and a fine weather has conspired to come up with a powerful and numinous snapshot of the Half Dome in winter and sunset.